MIB 23 was actually going to happen there for awhile. The movie would have been a crossover between two of Sony’s biggest ongoing franchises, Men in Black and 21 Jump Street. The project picked up a lot of steam, with Channing Tatum and Jonah Hill attached to star. It stalled, and soon Sony was simply rebooting Men in Black instead with a spin-off movie. Now, it looks like the ambitious project will never get off the ground. When Men In Black: International was announced, the writing was pretty much on the wall. It was taking too much manpower to get a crossover going with all intended parties. So now, fans are getting an MIB spin-off that stays within the current big screen canon but focuses on new Agents played by Chris Hemsworth and his Thor: Ragnarok co-star Tessa Thompson. Some were still holding out hope that MIB 23 was going to happen. As it stands, there is no 21 Jump Street sequel in development. Instead, Sony is planning another spin-off for that particular series, which will have female cops in the lead this time. It is rumored that Tiffany Haddish will play an older undercover cop who infiltrates high school as a teacher, and Awkwafina will play her younger, inexperienced partner who poses as a high school student. In a recent interview, MIB producer Walter Parkes explains what happened to the epic crossover, explaining that the idea is completely dead in the water at this point. The intent to crossover Men in Black with Jump Street was revealed in a number of emails from the 2014 Sony hack scandal. 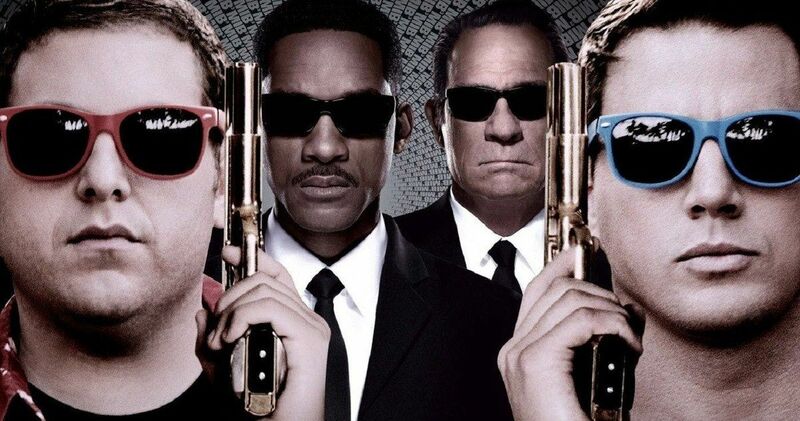 Original Jump Street movie directors Phil Lord and Chris Miller, who were notoriously fired from the Star Wars spinoff Solo, had been working on a script that placed Schmidt and Janko in the MIB agency. At one point, Jonah Hill was quite enthusiastic about the prospects of the movie, calling it, “clean and rad and powerful” in a leaked email to Sony Pictures boss at the time Amy Pascal, who stepped down from her position, but still works with Sony, having just produced Spider-Man: Into the Spider-Verse. Phil Lord confirmed in 2014 that the MIB 23 idea was very real, even if it did sound pretty crazy. He said this to MTV at the time. As of 2016, the project was still moving forward, with Muppets Most Wanted director James Bobin officially hired by Sony to take on the ambitious crossover While he talked up the project in the press, later that year Jonah Hill came out and said that the movie would probably never see the light of day, because it was becoming to hard to lock in all the moving pieces. Basically, the project imploded on itself. It’s unclear if the movie would have even moved passed the idea stage had it not been for the leaked emails, which indicated that there was interest from the moviegoing public in seeing such a thing happen after word got out. Now, fans will just have to be content with Men in Black International and the upcoming Jump Street spin-off. This news comes from Yahoo by way of Empire Magazine.